Since our last post we visited the northern-most point of our journey for this season, Puerto Rico, and have now started our trip home to Grenada. 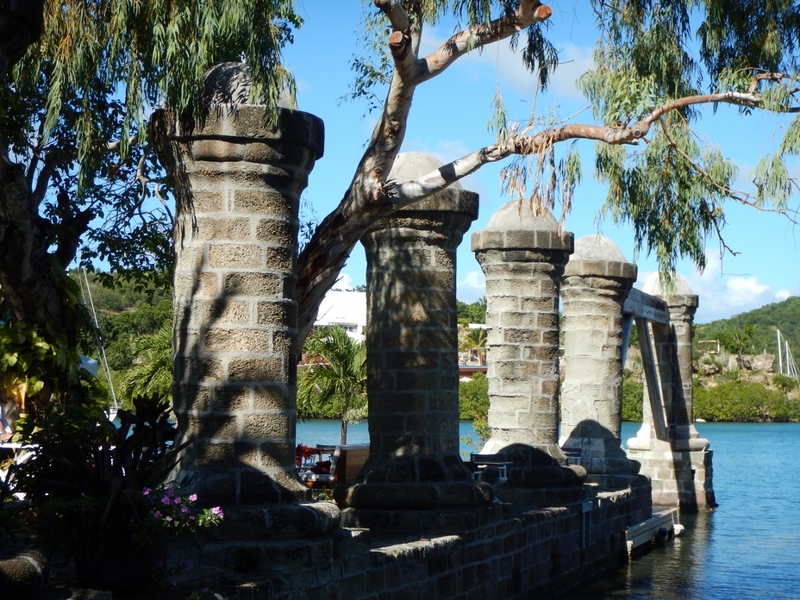 In our last post we had just arrived in St Croix, the southern-most island in the USVI (United States Virgin Islands). 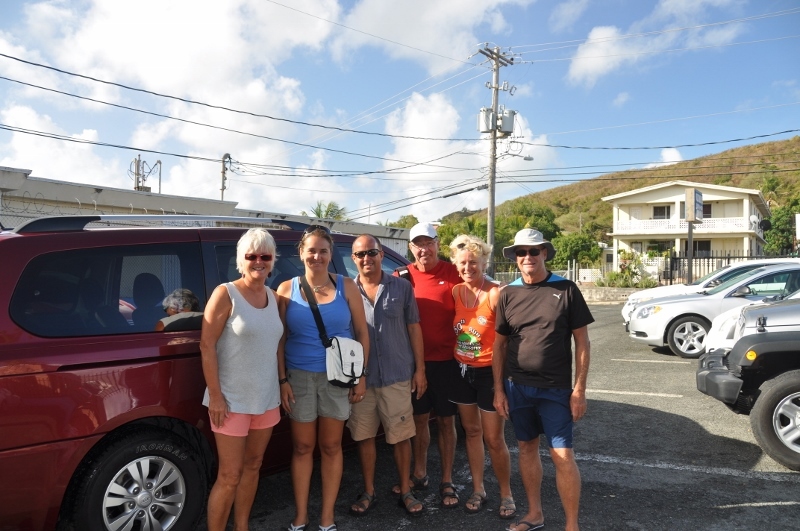 We spent about 10 days on St Croix with good friends Gwen & Guillaume from Slow Waltz and Dalynn and Glenn from Amoray. 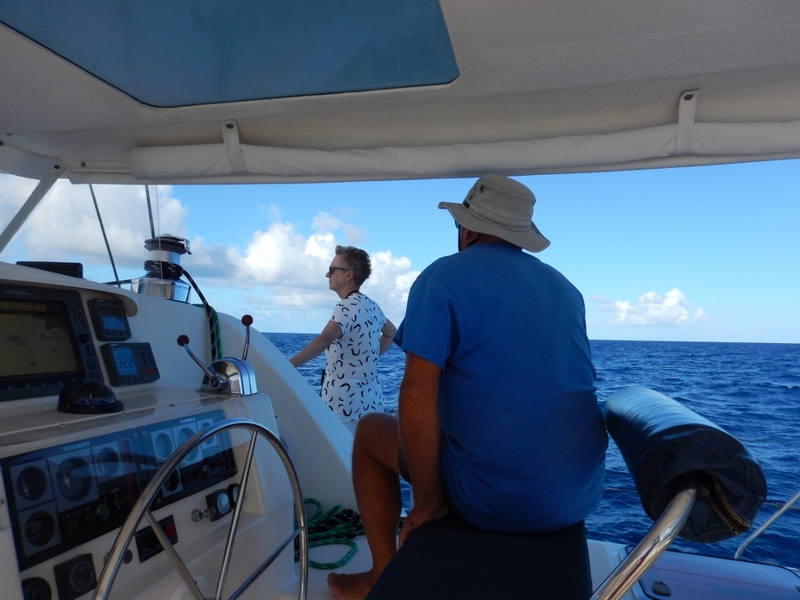 Initially we anchored off the pretty township of Christiansted but after a few days moved around to the beautiful anchorage of Fredriksted. We hired a car for a day tour and, given the driving is on the left-hand side of the road, I volunteered to drive. The strange thing is they have American cars so the driver sits on the left! Crazy! When it came to returning the car it was evident we were subject to the ‘GG curse’: a flat tyre only to be replaced by a flat spare tyre! Note to self: don’t hire a car with Gwen and Guillaume. Ready for our day-trip around the island. We enjoyed a wide variety of cultural activities: rum sampling, hermit crab races and Art Thursday, which is where we heard about “chaney”. Apparently, during a slave uprising in 1878, plantation houses were attacked, set on fire and valuable items such as china bowls and jugs were smashed. Crucian children found the broken shards and used them as play money. The term chaney is a combination of “china” and “money”. They have been found across the island and created into jewellery. Dalynn and I purchased two pieces and were also lucky enough to find a piece when scouring the beach in Fredriksted. Cool! The diving under the Fredriksted Pier was sensational. We had two very special finds: two seahorses and one baby octopus being harassed by a blue-headed wrasse. 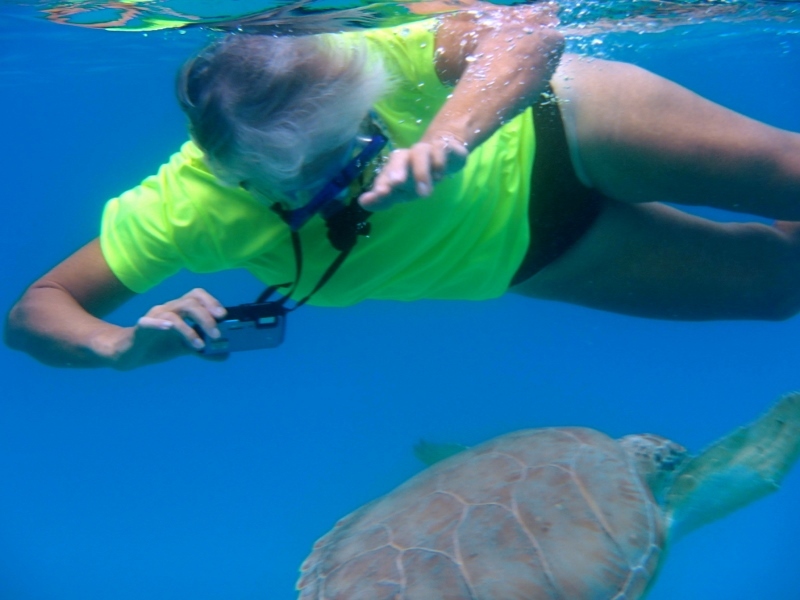 Whilst enjoying a beach BBQ organised by Lynne and Eric of s/v Amarula, we discovered there is a ‘friendly’ green turtle called Charlie near our anchorage. Apparently a local has been feeding him sardines so we went to meet him. He was pretty friendly and swam amongst us but when I stupidly put my hand out he bit my finger! He wasn’t too happy with the taste so didn’t hang around too long. 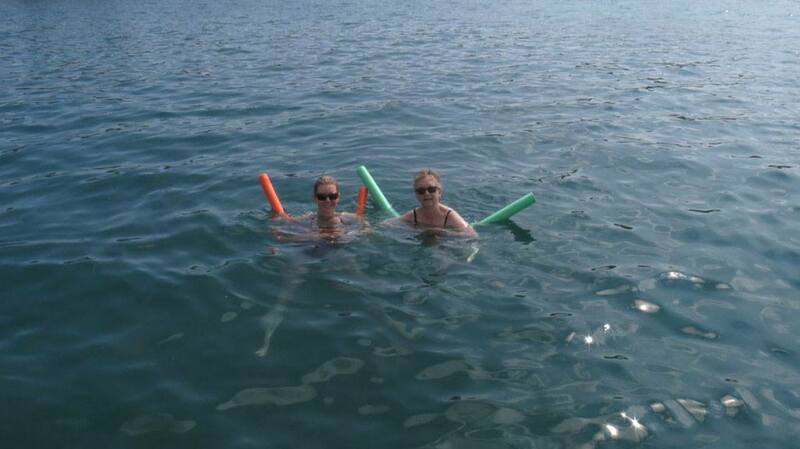 We were super lucky to also experience swimming with dolphins in this location too. How good is that! 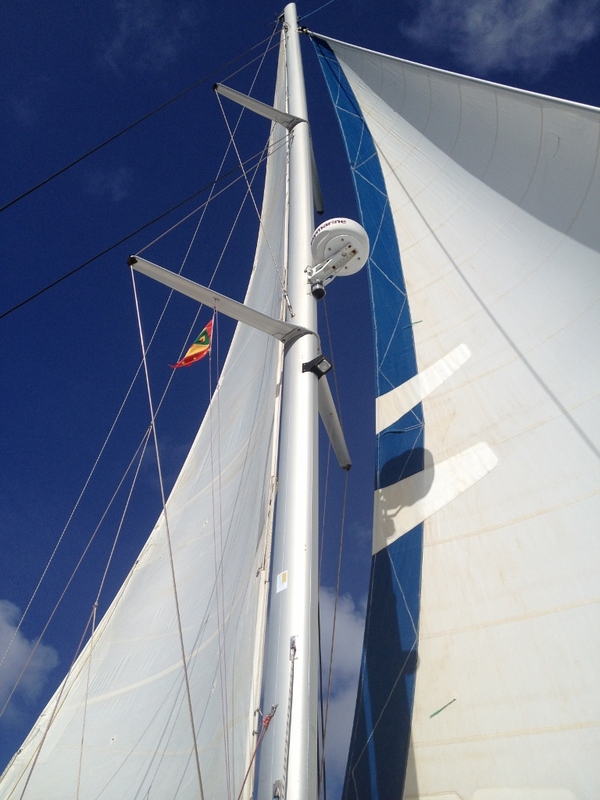 Leaving St Croix behind, we sailed north-west with Slow Waltz to Culebra in the Spanish Virgin Islands. We discovered Culebra is part of Puerto Rico and that there isn’t really a “Spanish” Virgin Islands. Puerto Rico is part of the US but, for some reason, we had to clear-out of the USVI in St Croix and clear-in to Puerto Rico, exactly as if it’s another country. Anyway, Culebra was great and we loved it. Playa Flamenco is a beautiful beach and down one end there are abandoned tanks once used by the US for target practice but now decorated with funky graffiti. Apparently there is unexploded ordinance on the island so we ensured we stayed on the walking tracks thereby avoiding any unwanted explosions! Again, we had another ‘special’ find: a mobile octopus. 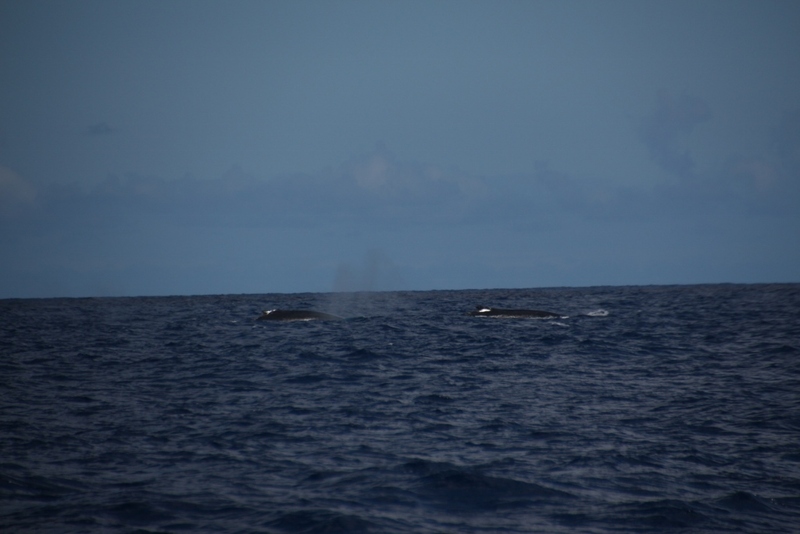 We see them hidden in crevices but very rarely out and about so this was a good sighting. 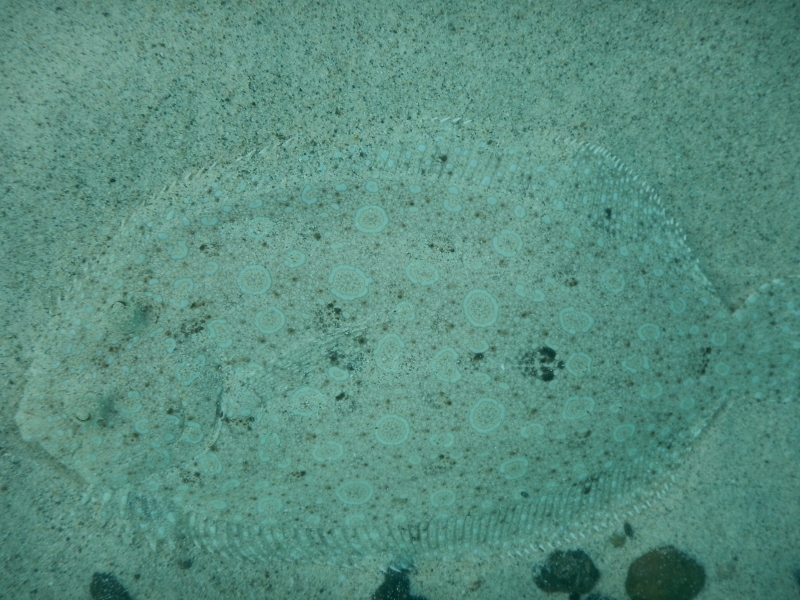 Check out our Team Kool Kat Youtube Channel for a 36-second video of his amazing variety of camouflages. Street art on the tiny island of Culebra was gorgeous. Whilst in Culebra we took advantage of the $1US fare for the 1.5hr trip by ferry to mainland Puerto Rico. Again, we hired a car and spent the day in the capital, San Juan, and doing some much-needed shopping at the fabulously-priced US malls. Given they drive on the right-hand side, Guillaume offered to do the driving. No arguments from us there and we’re delighted to say the ‘GG curse’ has been lifted – no flat tyres! Old San Juan was a pleasant surprise – so European and very elegant. The streets have blue cobblestones, there is a majestic fort and the city villas were stunning! 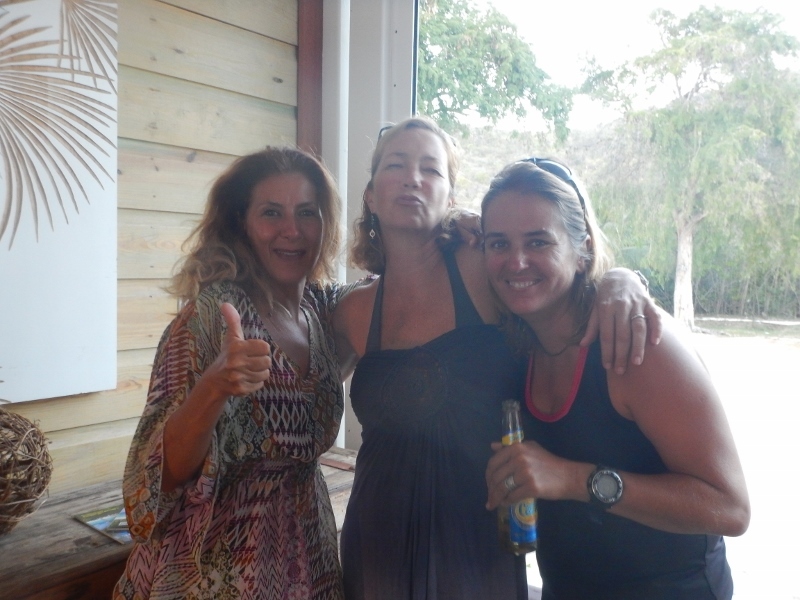 We enjoyed our taster and vowed to return to Puerto Rico next season for a decent amount of time. So now we need to turn around and go back down the island chain. Back to the BVIs to clear-in and out at Jost Van Dyke. 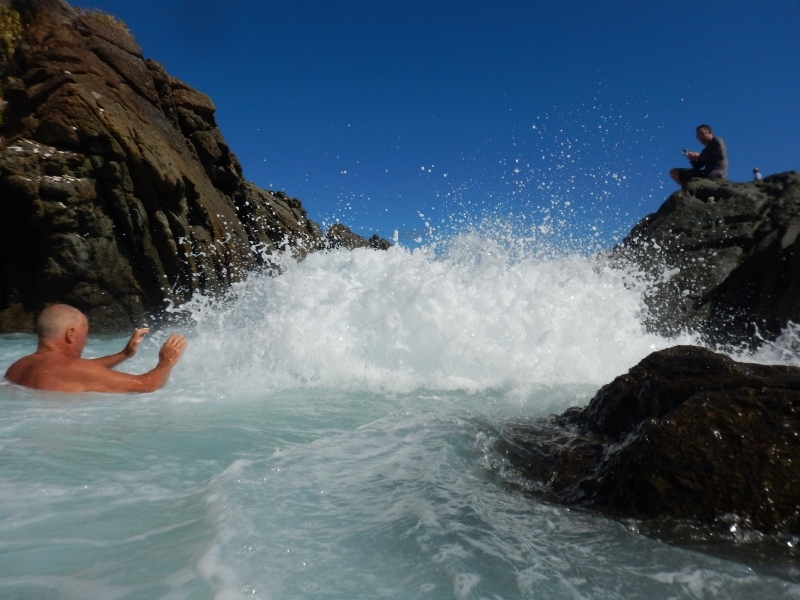 We stopped at The Baths on Virgin Gorda and left for Sint Maarten from Cooper Island. Check out our video of The Baths on youtube. We did an overnight sail to Sint Maarten which means with 80+ nm to cover we left Cooper Is at 5pm anticipating a 14hr sail. Normally we’d have a schedule of two hours on and two hours off for each of us. Unfortunately, I was ill and Mal had to do the whole night without any help from me! Needless to say he was exhausted when we arrived in Simpson Bay. I was well enough to do the anchoring but egads the remote control for the windlass wasn’t working so I had to motor around for almost an hour whilst Mal worked out what was wrong! A broken connection! Mal did a quick temporary fix joining the wires back together and we eventually dropped the hook 15 hrs after leaving the BVIs. Aah, the joys of sailing! I’ll put a halt here so until next time, keep well, and warm if you are in Oz. We have been in The Virgin Islands for just on a month now and they are stunning! There are over 100 islands, both large and small, inhabited and uninhabited and they are a cruiser’s delight! It is very quick and easy to sail to other islands or to find a protected bay if needed. 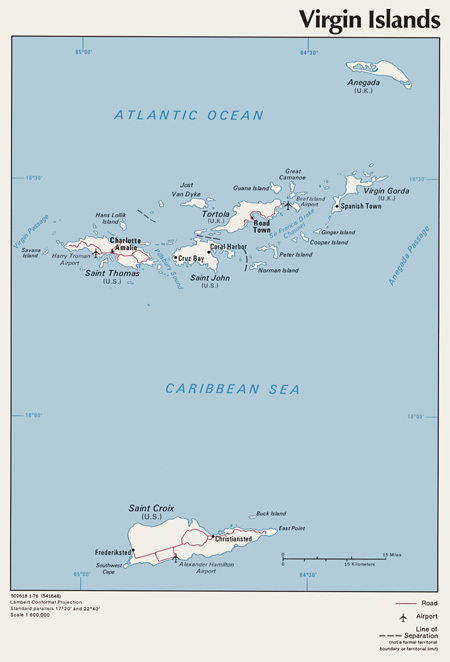 To the east are the British Virgin Islands (BVI) and to the south and west lie the US Virgin Islands (USVI). There are three larger islands in each country and lots of smaller ones dispersed throughout. We are currently in St Croix (bottom of the map) in the USVI and really enjoying this low-key island. These photos are just a quick snapshot of our month here. Most islands satisfy our basic needs: good hiking, interesting flora and fauna and fabulous snorkelling. A rest from hiking, overlooking Saba Rock. 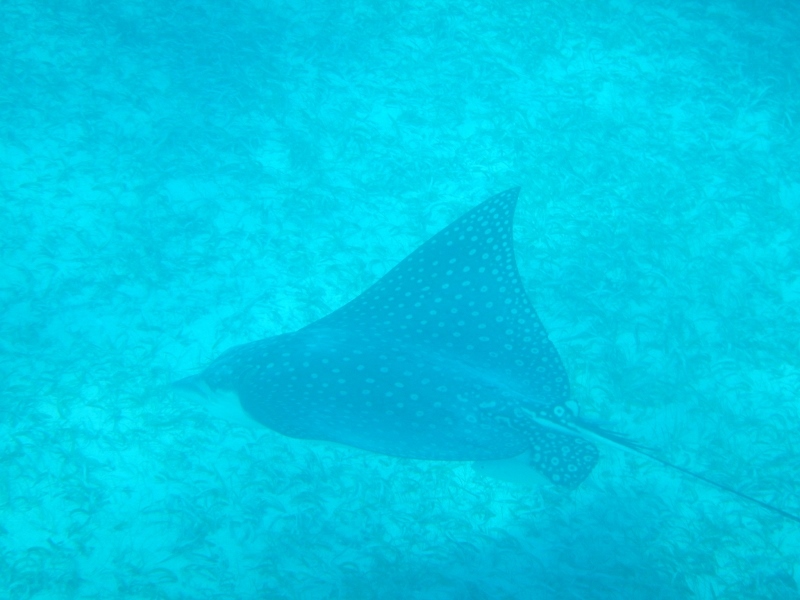 We swam with Spotted Eagle Rays who seemed to feed under our boat! They have beautiful markings and the tail is three times longer than the photo shows. Absolutely majestic and not worried about us. After much toing and froing through Facebook we were able to coordinate a gathering at Norman Island (six boats) so we hightailed it down the Francis Drake Channel, which I liken to a water super highway and reminds us of the Australian Whitsundays. 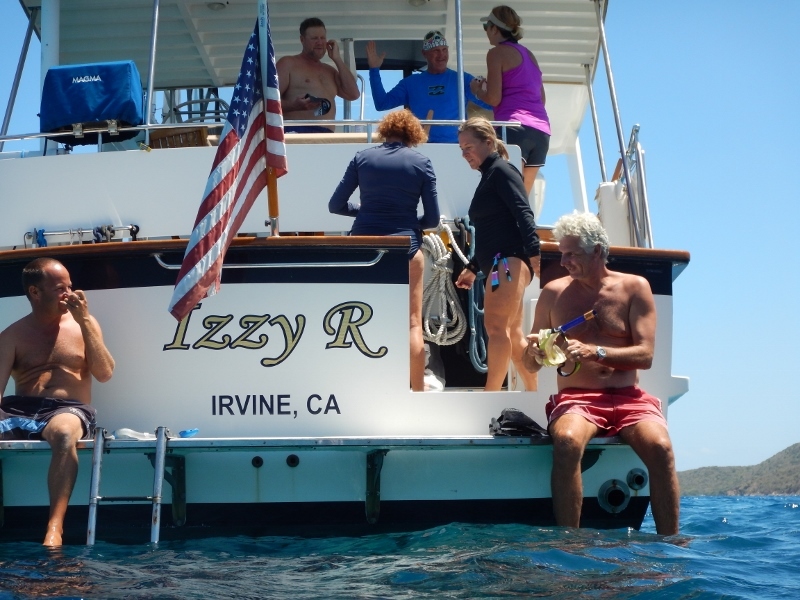 It was great to catch up with friends and we did some fabulous snorkelling off the back of Izzy R at a rocky outcrop known as The Indians. 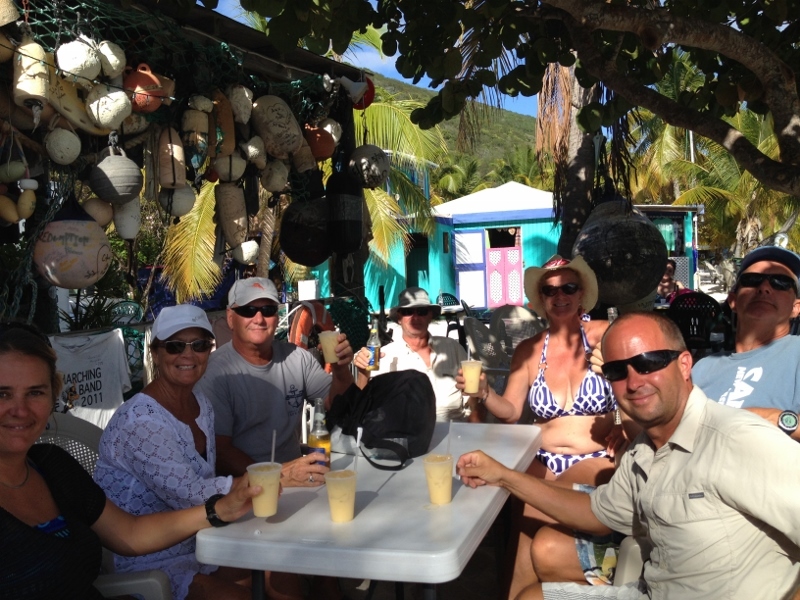 Then it was off to Peter Island for a night before heading to Jost Van Dyke Island (JVD). 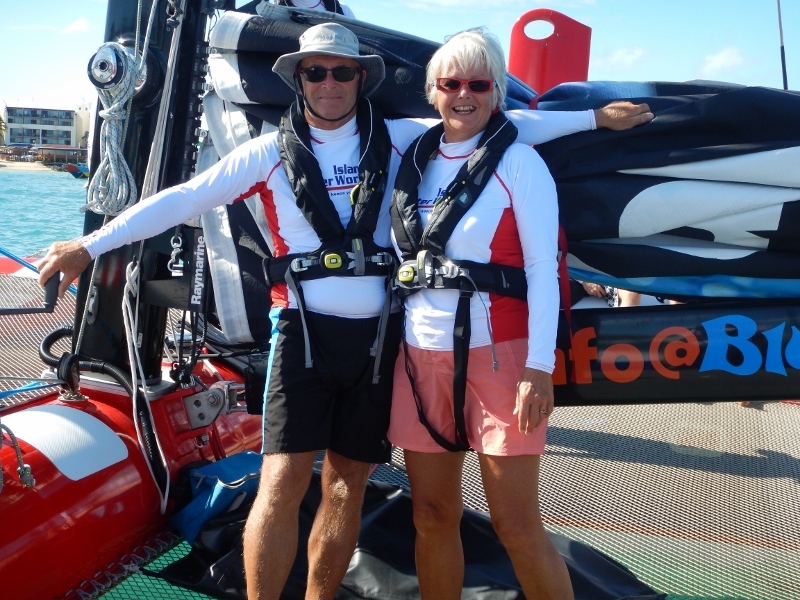 We were lucky to catch up with Jo and Gregg from s/v Serenade and their guests. The next day we walked to the Bubble Pool on JVD. Looks pretty calm…..
L-R: Gwen, Guillaume & Mal waiting for the bubbles! Whoa, get me outta here! 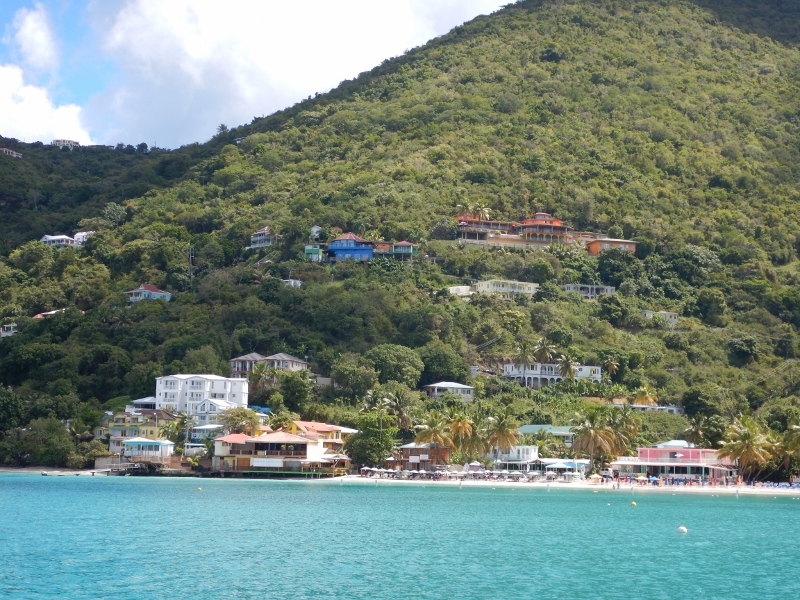 Off the next day to Cane Garden Bay on Tortola. A very pretty anchorage and we enjoyed a few quiet days here. 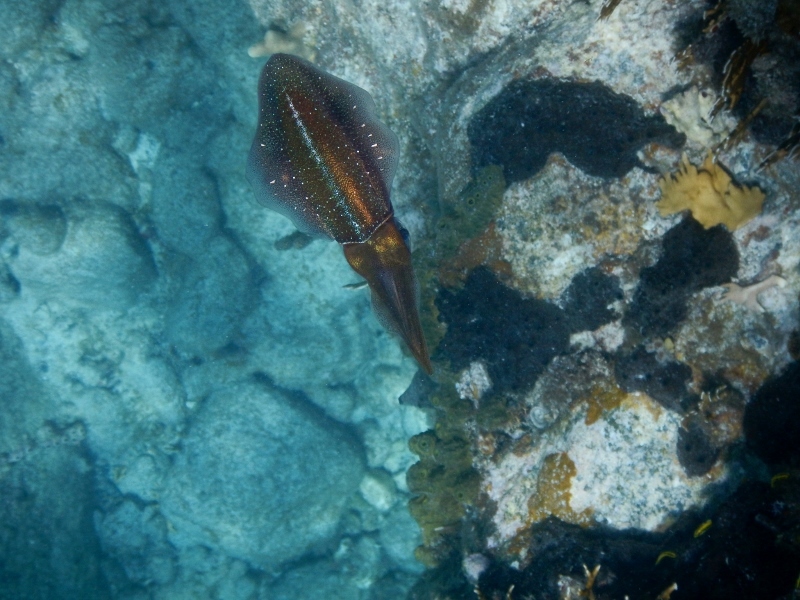 Very typical of the bays on many Caribbean islands. Over to Sandy Cay, near Little Jost Van Dyke. This is a tiny island that Laurence Rockefeller owned and gave to the Brits. 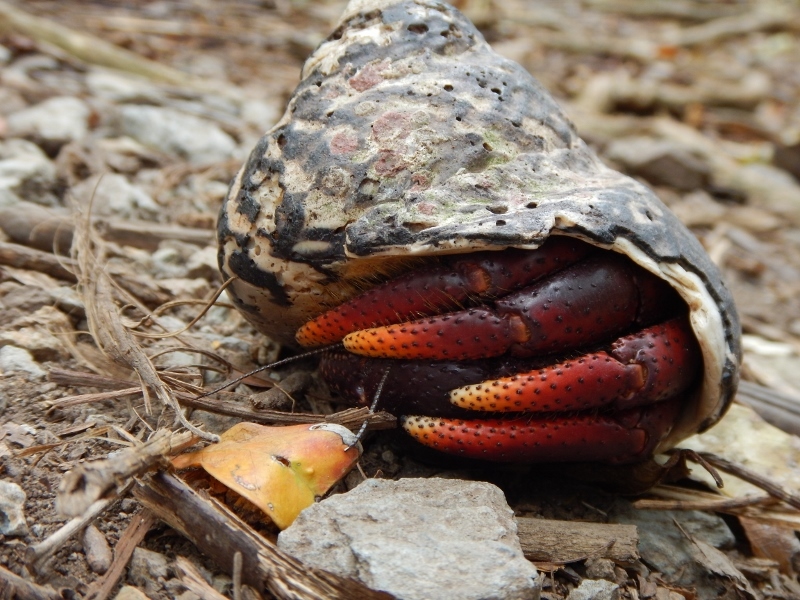 It’s home to the biggest collection of hermit crabs I’ve ever seen! It’s also totally untouched and a pleasure to take the short trail around the island. We then cleared out of the BVIs and entered the USVIs at St John. What an amazing island. Again, thank goodness for the philanthropy of Laurence Rockefeller. He bought huge tracts of land (almost 2/3rds of the island) and bequeathed it to the US subject to it gaining National Park status. It is now a National Park with fabulous hikes and underwater marine parks. This is where I swam with an endangered hawksbill turtle and saw my first nurse sharks. Not worried at all. 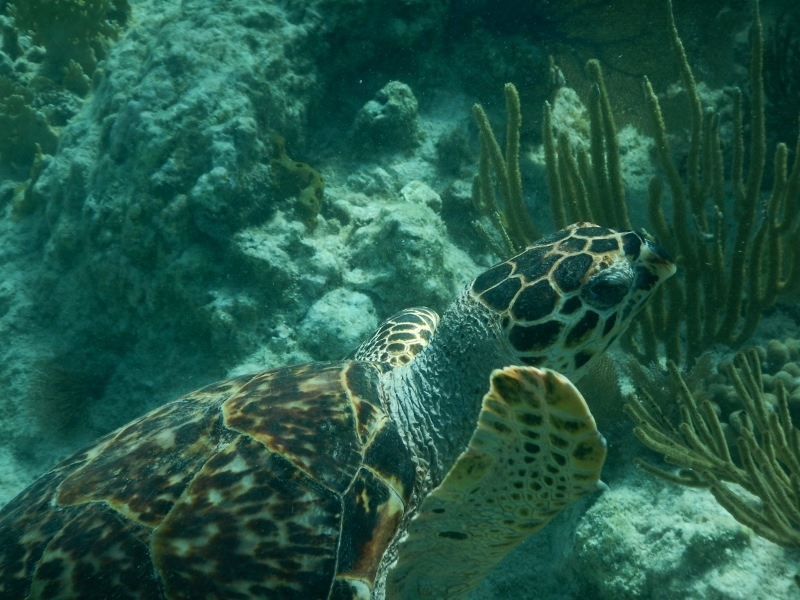 Green turtles are more skittish but the Hawksbill is much more relaxed. 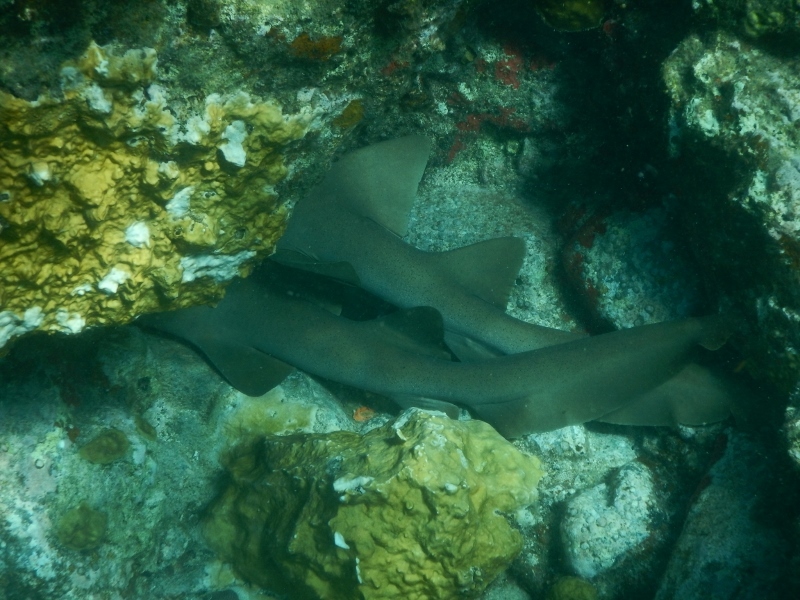 Apparently it’s common practice for nurse sharks to sleep under ledges. 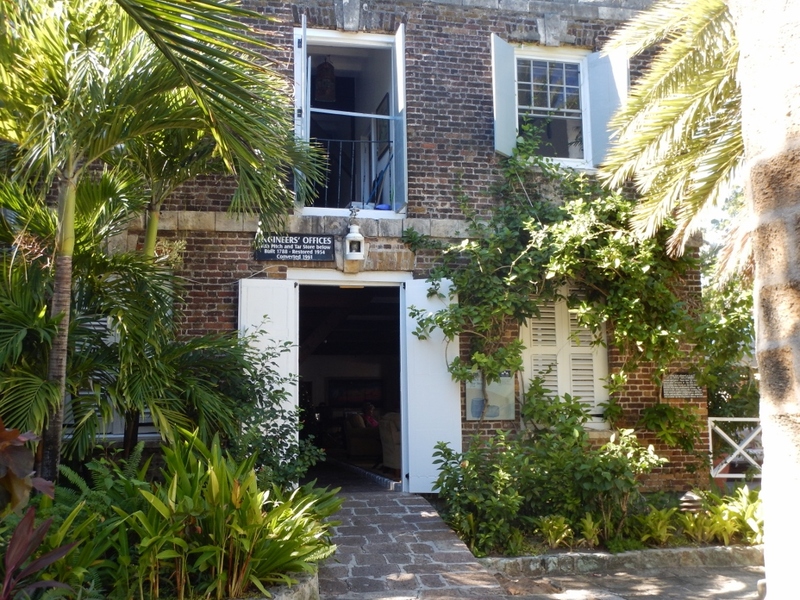 As with most Caribbean islands, St John has had many ‘owners’; Spanish, British and Danish. It was built on slavery and had a substantial sugar industry until sugar beet came on the scene and slaves were freed in 1848. 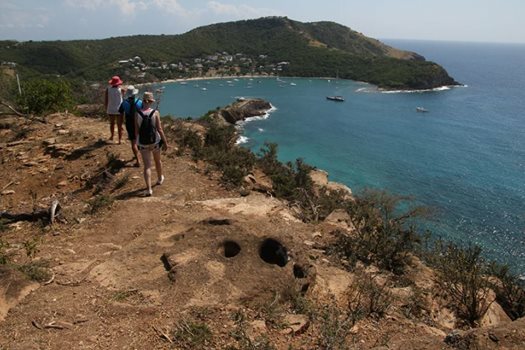 There are lots of sugar mill ruins and plantation estates throughout the island which make for very interesting hikes. We often caught a glimpse back in time and got our minds imagining what life may have been like with some of the estates looking very grand. The US purchased the islands from the Danes in 1917 for 25 million in gold. 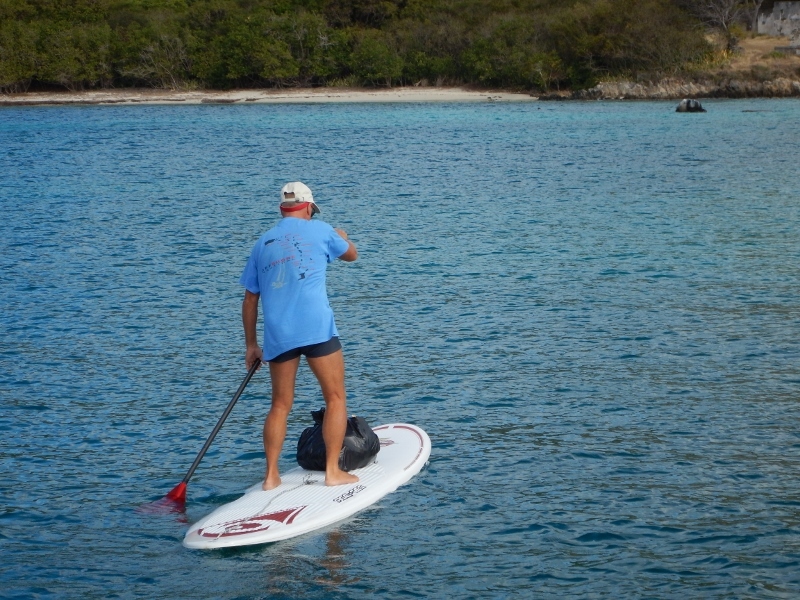 On St John we stayed at the following bays: Caneel, Maho, Waterlemon, Salt Pond and Little Lameshur. 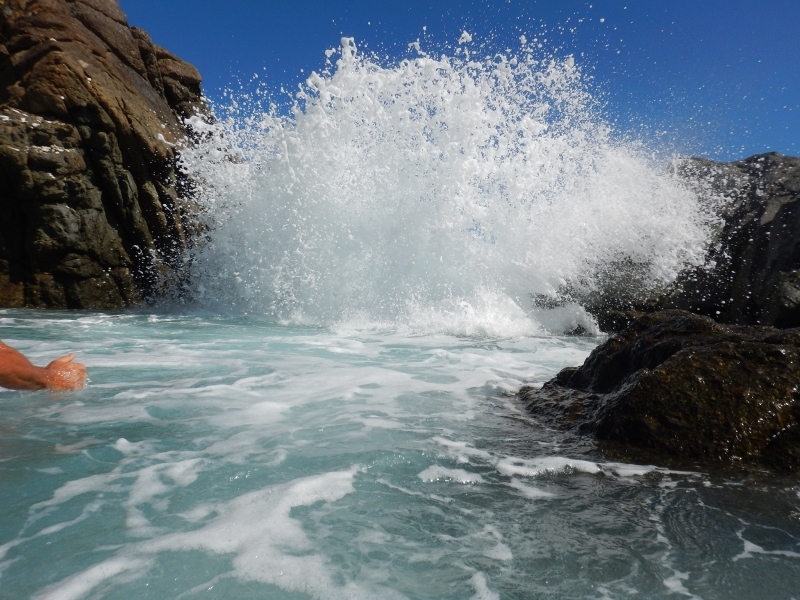 Each had their own beauty with hikes and snorkelling – what more could you ask for? 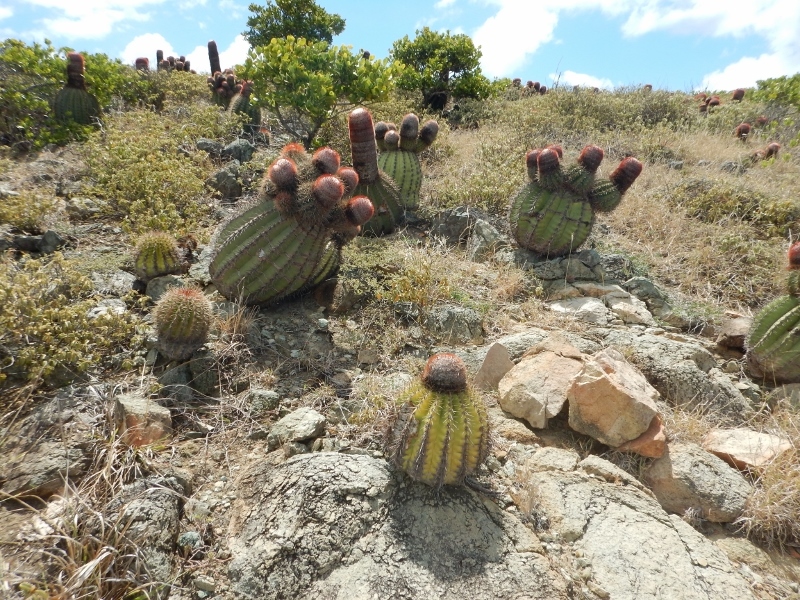 This cactus is common throughout The Virgin Islands and has a wonderful little fruit very high in Vitamin C. Check out the pics. Turks Cap Cactus at Rams Head, Salt Pond Bay, St John. Just give it a little tug. Gorgeous and a little like dragon fruit. 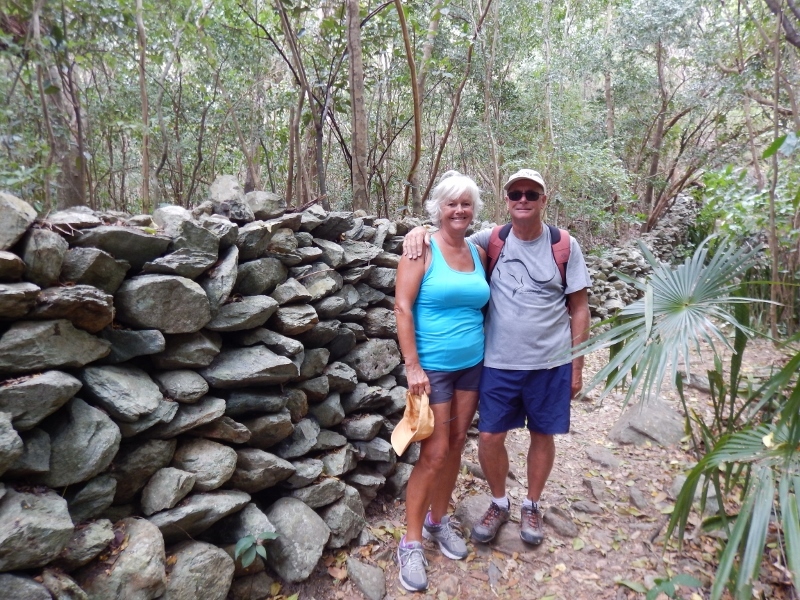 Then it was a hike to the Petroglyphs, the ruins of the Reef Bay Sugar Mill and the ruins of the Reef Bay Estate atop a hill. 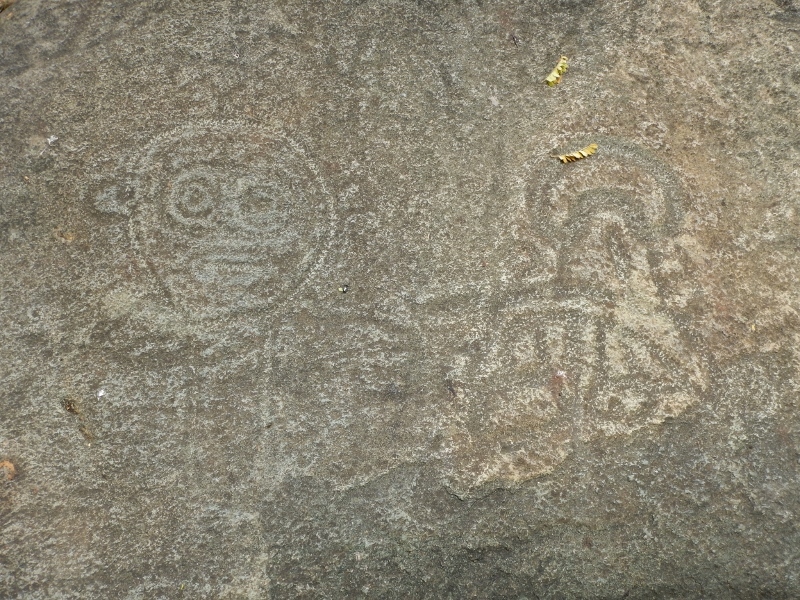 The Petroglyphs are attributed to the Taino Indians and date to between 900-1500AD. Fabulous rock walls litter the whole island. Rock carvings are attributed to the Taino Indians. Then it was Mal’s birthday. He had a breakfast fit for a king, enjoyed his present and shared a beautiful meal at night with Gwen & Guillaume. Birthday present, a Stand Up Paddleboard, sure comes in handy when doing the rubbish run! Below are some underwater pics I just love taking! 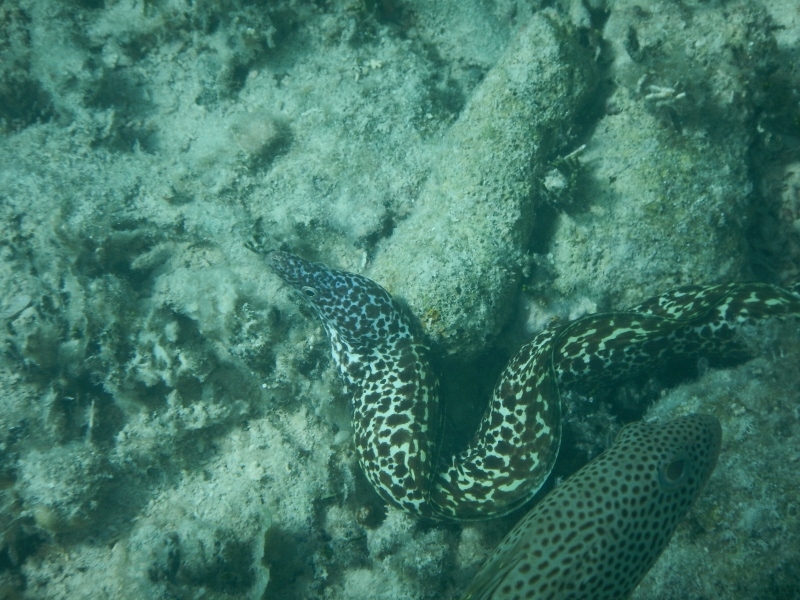 A Red Hind harassing a Spotted Moray Eel. 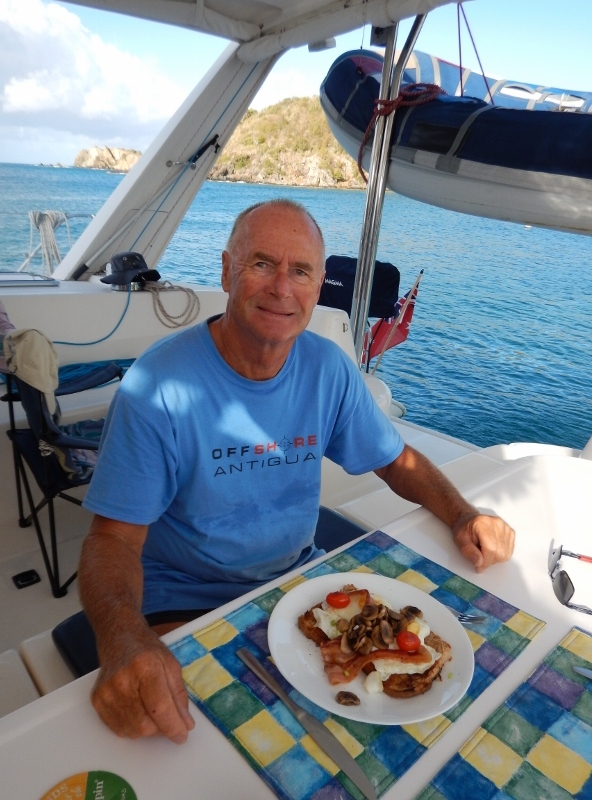 We are now six as Dalynn and Glen from S/V Amoray have joined Kool Kat and Slow Waltz and we are spending a week or so here in St Croix. 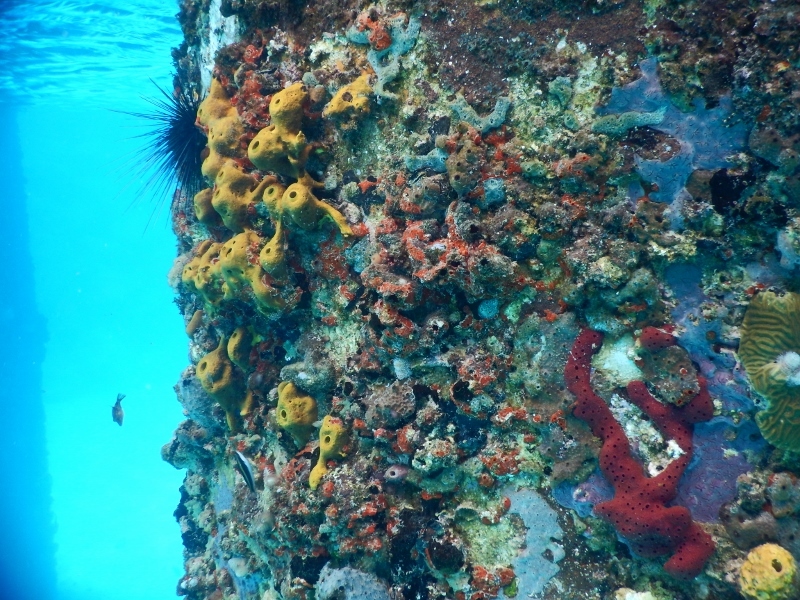 Gorgeous corals on the Fredriksted pier in St Croix. This is a month’s worth of news so I’ll stop here. St Croix has heaps of interesting bits and pieces too so that will have to be in the next update! 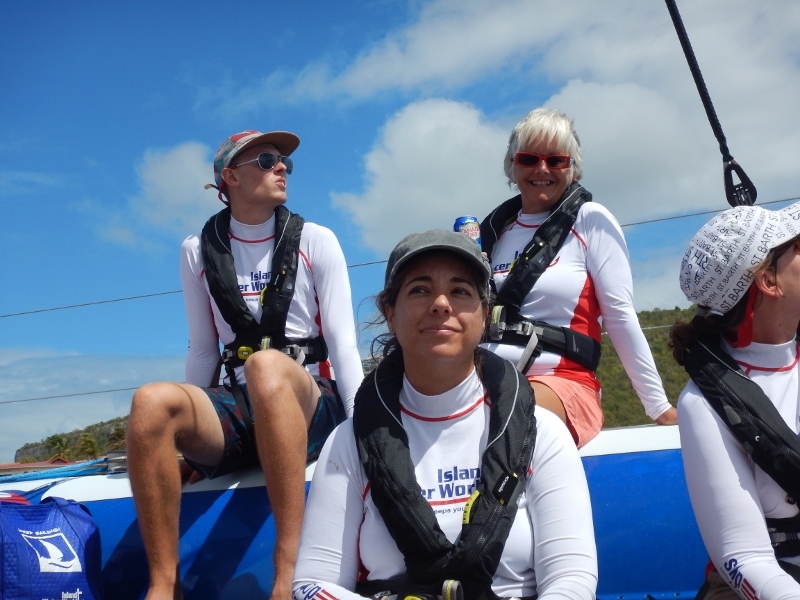 Throughout Antigua and Barbuda, and now The Virgin Islands, we have been boat buddies with Canadians, Gwen and Guillaume from s/v Slow Waltz. They have been a delight to travel with and we have shared some amazing times together and created incredible memories. 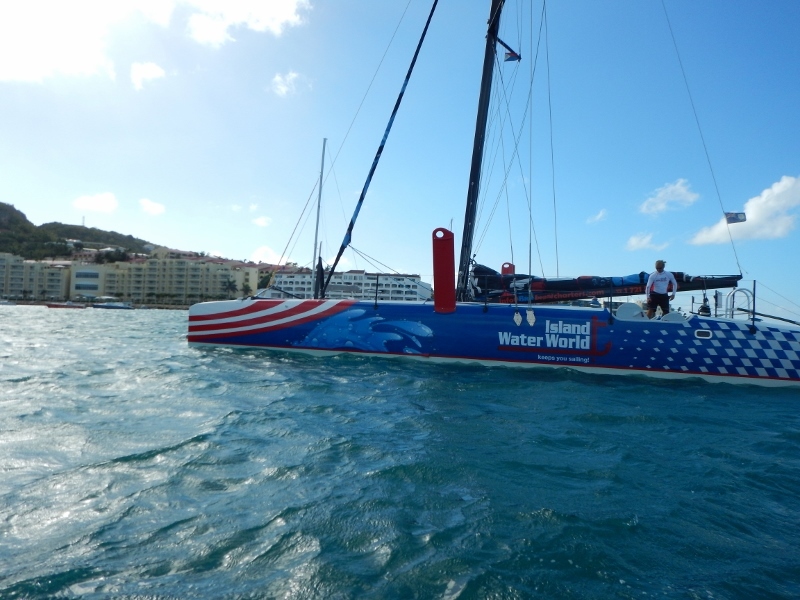 Whilst in Sint Maarten I entered a competition at Island Water World (IWW) where us cruisers seem to spend copious amounts of money! I wasn’t really sure what the prize entailed except I knew it had something to do with watching some of the 35th Heineken Regatta. 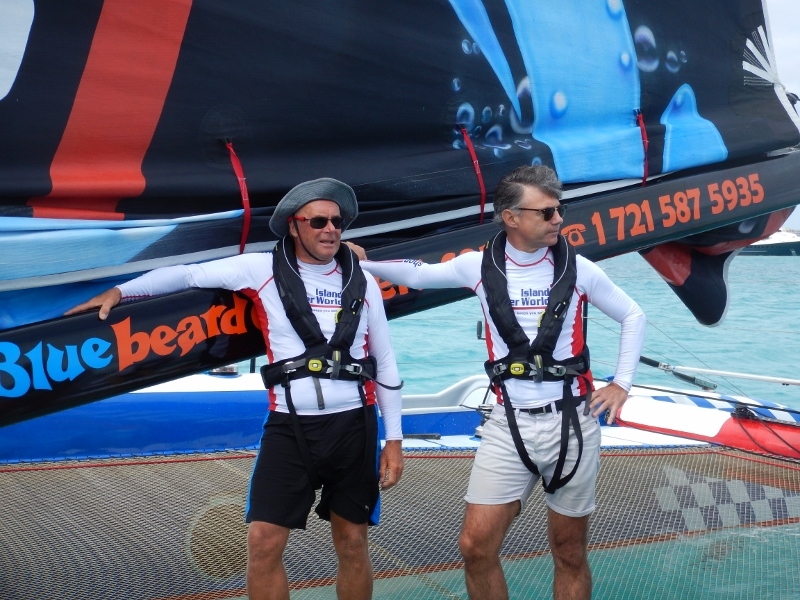 I received an email advising that I’d won and would be joining 10 other winners the next morning out on the water on the IWW 52′ Racing Catamaran. I wondered if Mal was included so I emailed back asking the question to which the response was, sure, bring him along too. Ooh, all of a sudden this is real. 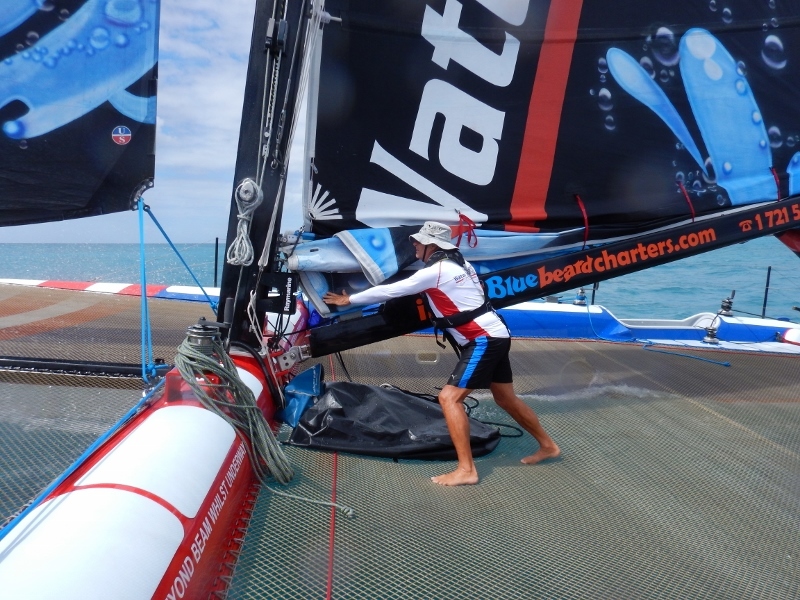 It’s been a bit windy, like 25 knots windy, and I get a tad seasick in rough conditions. Do I really want to go? Perhaps Mal could go on his own. Heck no, I want to go too, even if it’s just to get my free IWW rash-guard! Mal assures me I’ll be fine; yeah right, he always says that! 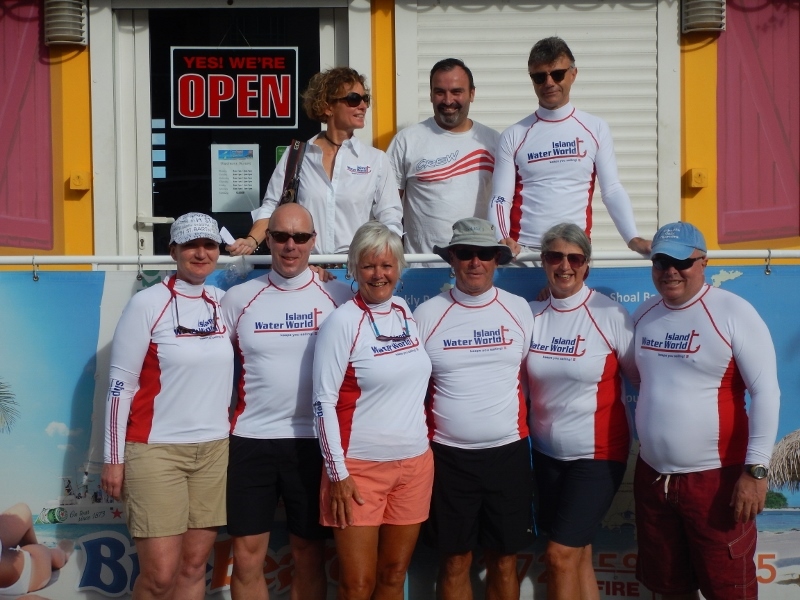 So with trepidation we head out the next morning to meet the fellow winners, receive our rash-guards, sunglass holders, both kindly donated by IWW, pose for the photo opportunity and board the vessel. Wait, there’s no cockpit, no saloon, no berths, nowhere to hide from the weather! 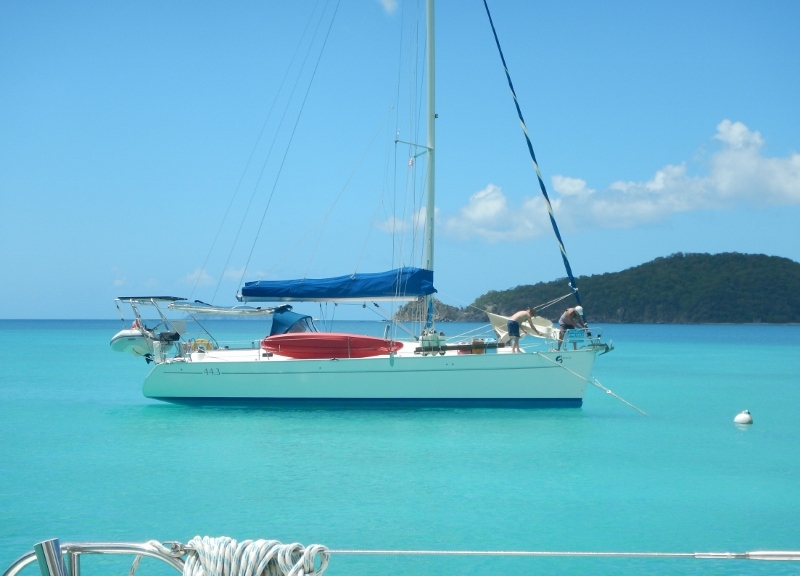 She’s nothing like our 47′ catamaran! She’s sleek, lean and light as a feather! I’m relieved to hear there is a head in one of the hulls! 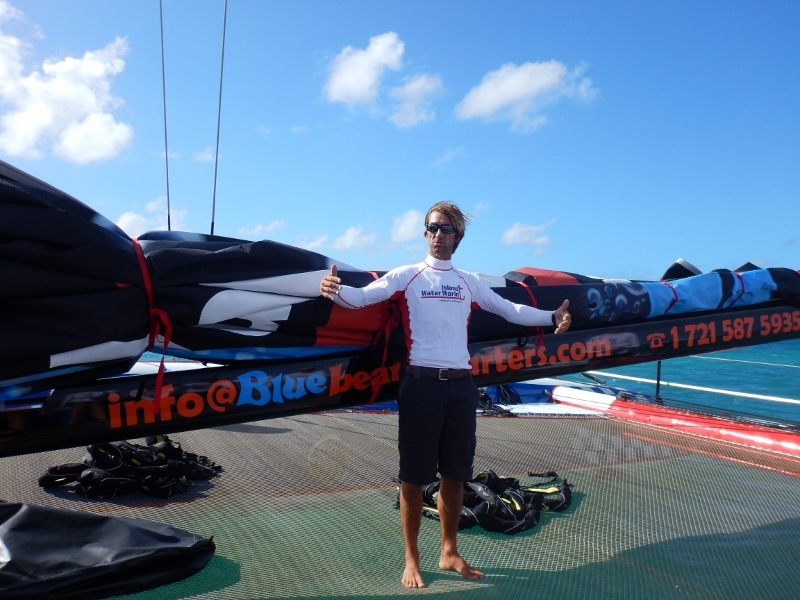 We are welcomed by Captain Rodney, crew member Guillaume and part-owner, Dominic. Rodney provides a safety briefing on deck, well, trampoline as there is no deck! We don the safety vests and away we go. I can’t back out now! Rodney explains we will head out to watch the start of the Commodore’s Cup, which is a pre-Regatta event, then motor alongside the leaders up to Phillipsburg where we will peel off, hoist the sails and sail back to Simpson’s Bay. We can ‘play around’ in the bay for awhile and, if there is time, approach the finish line to watch the end of the race. Everyone is excited and itching to get going. I’m still a little nervous as the winds are definitely picking up but my tummy is holding it altogether at this stage! Race participant, TAZ – Tasmanian Devil. In the end, we had a great day. There was lots of wind, rain, sun and we got drenched again and again. The rash-guards were brilliant as I wasn’t cold, even when I was wet through and they dried very quickly. 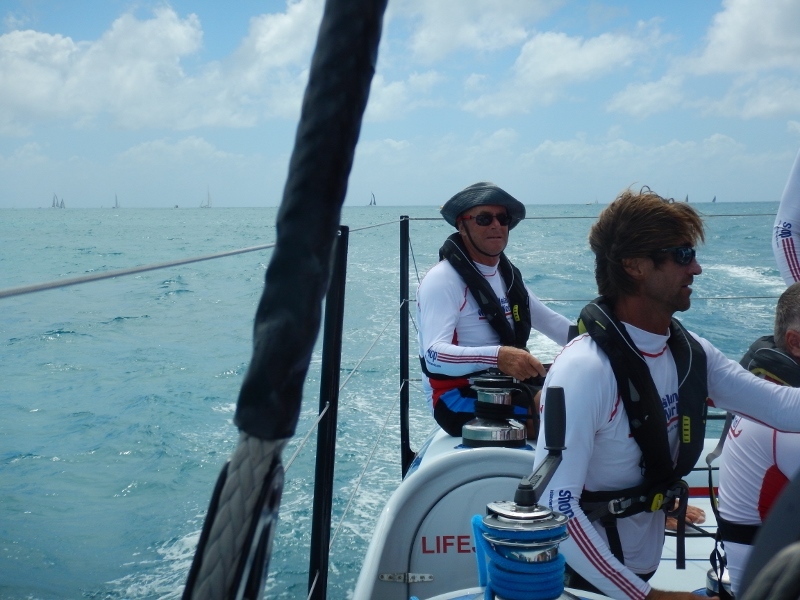 Mal had a turn on the tiller and got us up to 21.5 knots with two reefs in the mainsail. Mal bracing himself – we were hooting along! The cat is gorgeous. She only weighs 2.5 tonnes (Kool Kat weighs up to 33) and she has the latest and best equipment. Her shrouds and railings and, I think, the trampoline, are all made of Dyneema rope which is renowned as the “World’s Strongest Fibre”. 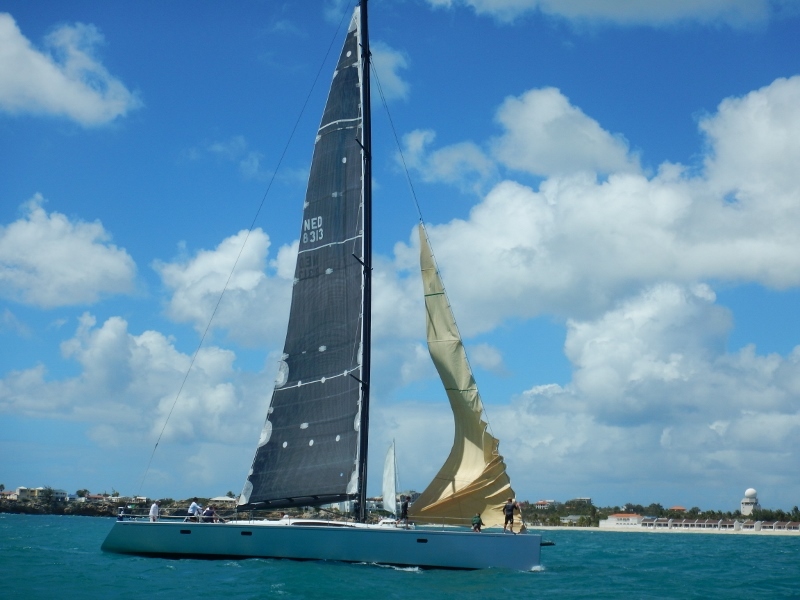 Her history is that a few years ago the owner-builder entered the Route du Rhum Solo Transatlantic Race from France to Guadeloupe, finishing in 14 days. 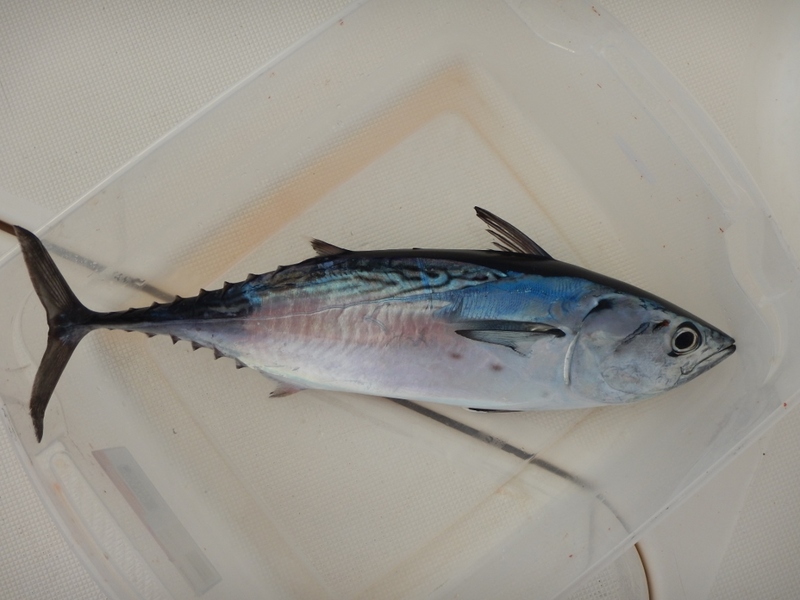 She then sat in a boat-yard on Sint Maarten until Dominic from Bluebeard Charters saw her. It has been a labour of love for him to bring her up to the boat she is today where they can now use her in the business. 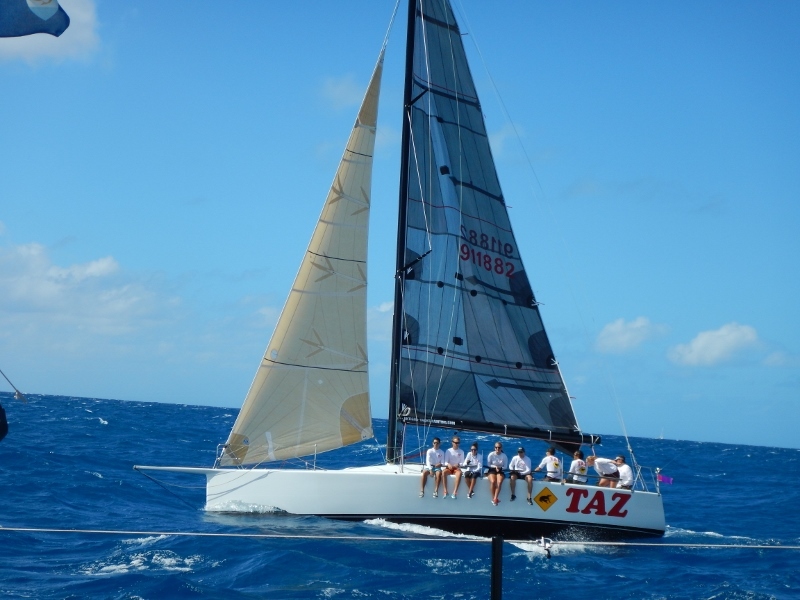 She will be ready and entered in the 2016 Heineken Regatta! Good luck Dominic. Click here for further information about her, and if you’d like to book a ride! Winner after crossing the finishing line. Island Water World, together with Dominic, were fantastic hosts and we had water, soft drinks and, of course, Heineken on tap throughout the morning. 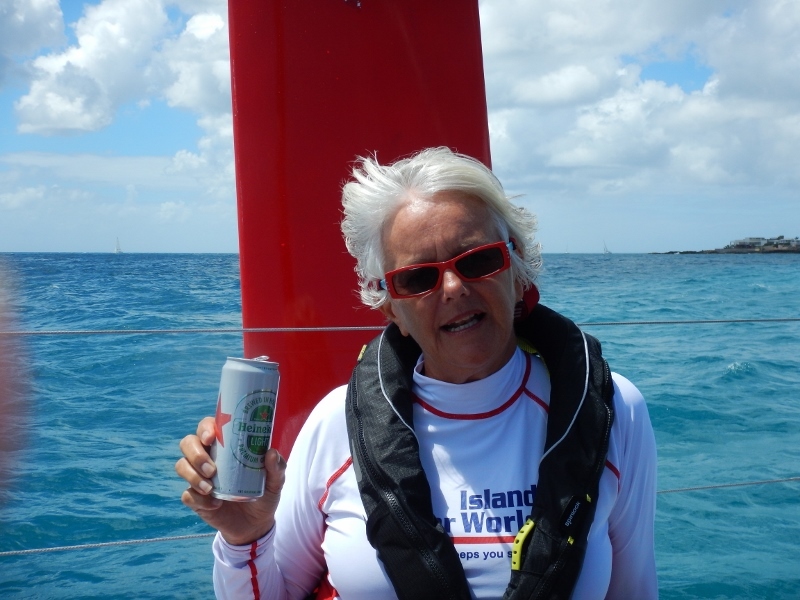 I wasn’t ill at all and still can’t believe I managed a beer whilst sailing! Thanks Dominic and IWW, it was a great experience! 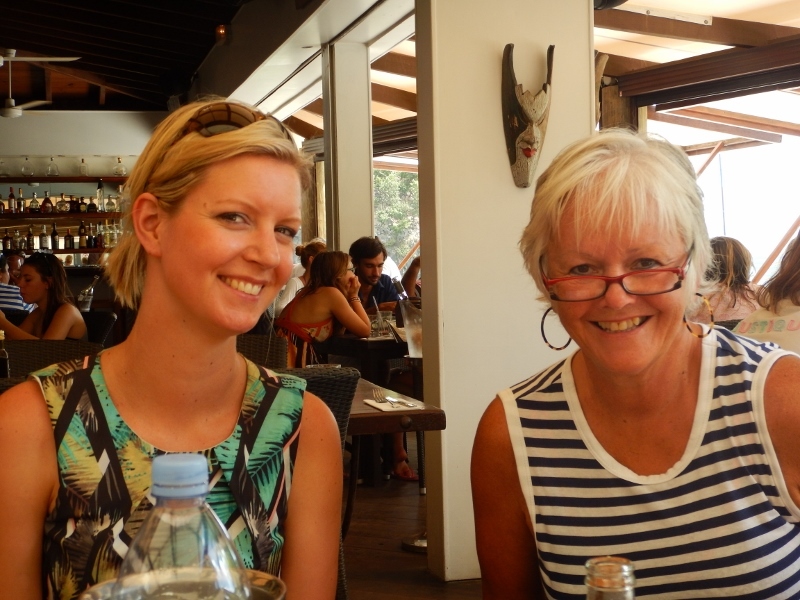 Until our next adventure, take care, Sue and Mal. It’s always great having guests to share our experiences and this time we had family! 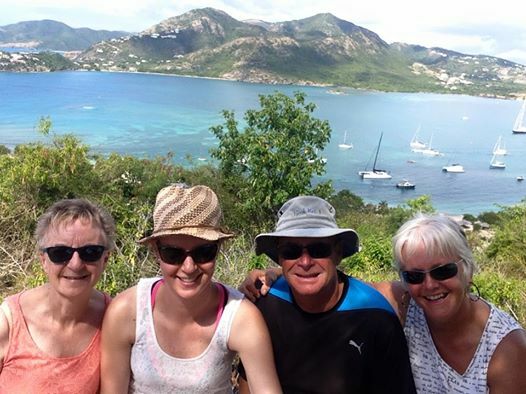 Mal’s sister and niece, Jan and Bri, arrived in Antigua on Jan’s birthday (11 February) for the start of their 3-week Caribbean holiday and took a few days to overcome the jetlag and heat, and to gain their sea-legs. St Barts has been fought over by the Brits, the Spaniards and the French. However, the French gave it to the Swedes in the 18th Century in exchange for free port rights in Gothenburg. Thanks to the Swedes for making it a free port which it still is to this day. Many of the buildings reflect the Swedish heritage but it was sold back to the French in 1878. As with other French islands, it is a commune of France but without many European laws. Visiting French islands for us is always like having a taste of France; cheap AND good wines, excellent food at reasonable prices and there is that certain joie de vivre! We were lucky to witness their annual Carnival. It is a fabulous family-friendly parade with everyone encouraged to dress up and enjoy the festivities. The next day we hired a car and did a day-tour of the island. It’s tiny with some gorgeous beaches but it has windy, narrow roads with lots of hairpin bends, big trucks, and they drive on the wrong, I mean right-hand side of the road! I was the designated driver but I had two back-seat drivers helping out! Thank goodness Bri was in the front providing support. All the beaches had beautiful signage and we loved their ashtray idea! Take a can of coke, read ashtray, off the hook, use it whilst at the beach and then return it to the hook. Voila, no dirty cigarette butts in this beautiful environment! Jan and Bri had their first of many up-close and personal turtle experiences with Bri being crowned official turtle-spotter! 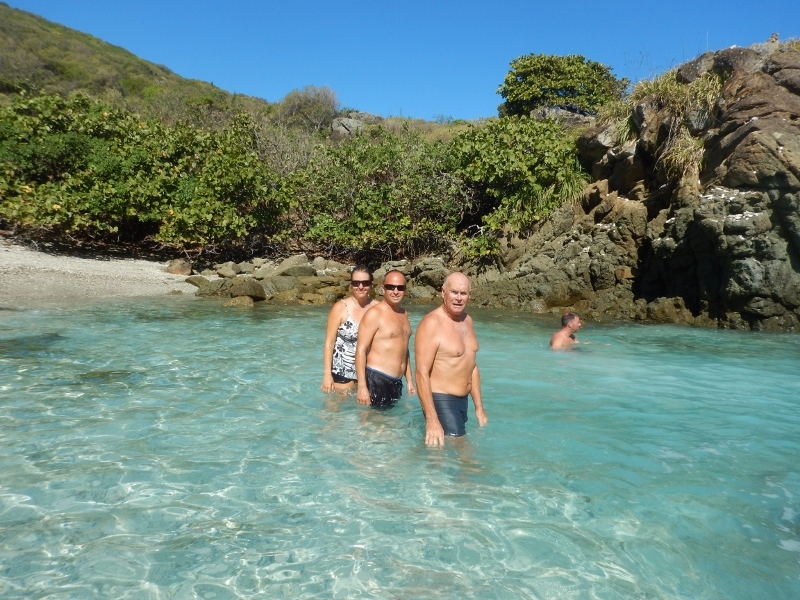 We also enjoyed some great snorkelling at Gros Ilets (off Gustavia) and in Anse de Columbier. 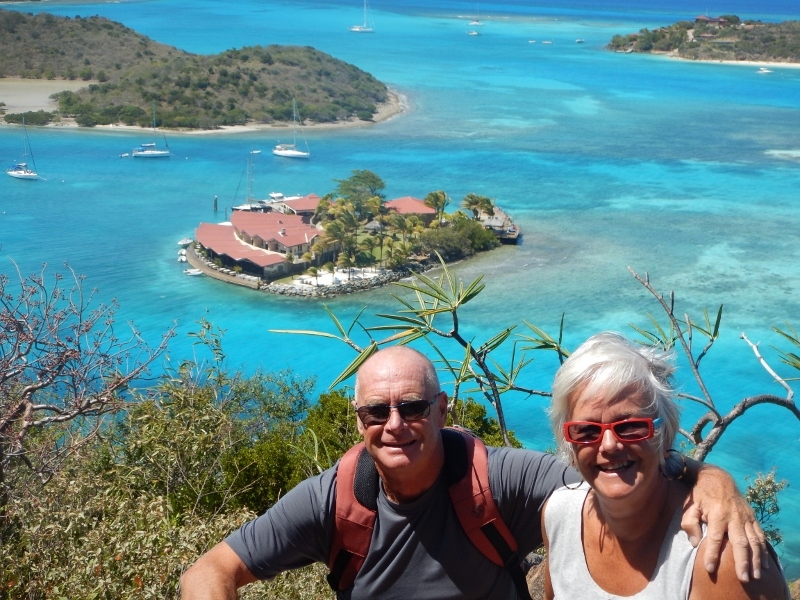 A hike to the village of Columbier gave us some amazing views across to Ile Fourchue and St Martin. 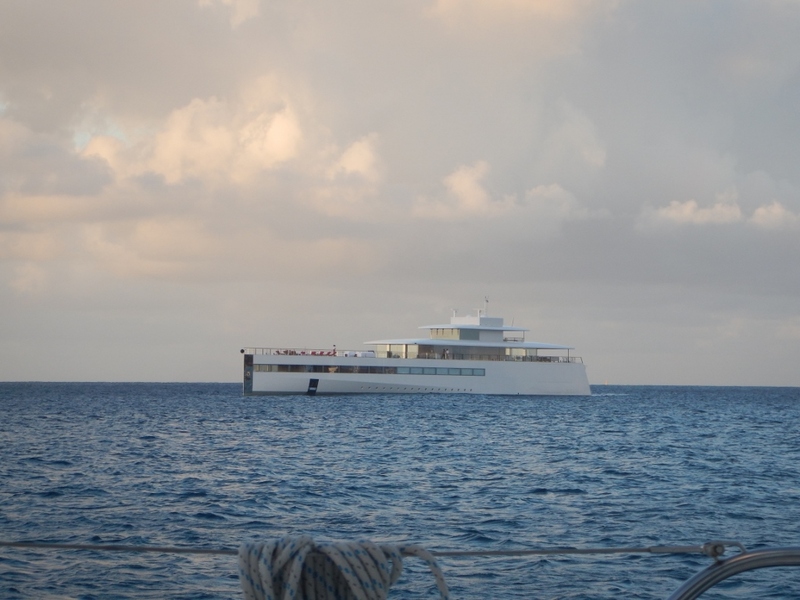 Steve Jobs’-designed boat, Venus, was anchored behind us in Gustavia. What do you think of her design? 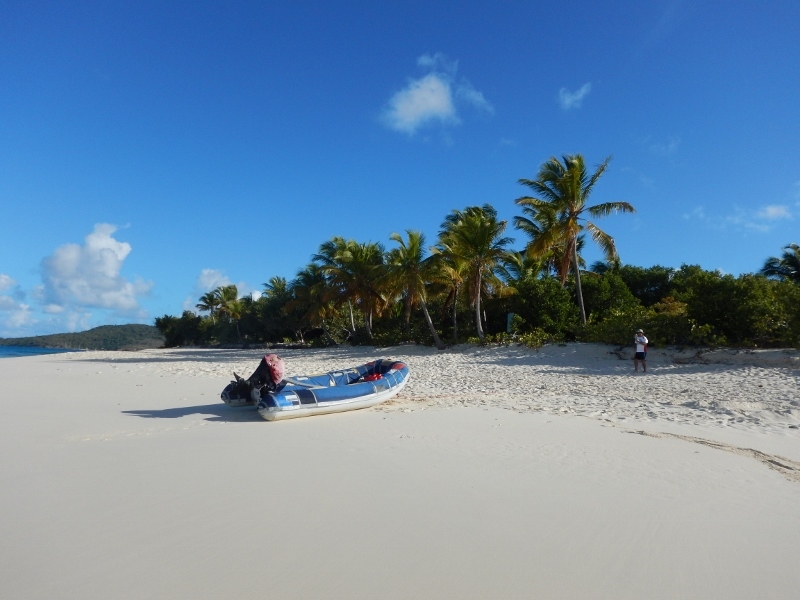 We stopped overnight at Ile Fourchue, an uninhabited island half-way between St Barts and St Martin. Again, there were turtles aplenty and a good variety of fish. Both in Anse de Columbier on St Barts and at Ile Fourchue, we were fortunate to snorkel and swim with turtles and off the back of the boat. How good is that! We dropped the hook and immediately joined friends from S/Vs Slow Waltz and Serenade in a walk to Shirley Heights, which affords beautiful views over English and Falmouth Harbours as well as boasting the best vantage point for sunsets. Shirley Heights is a military complex which houses many buildings including an old Signal Station. History states flags were flown by day and guns used at night to convey messages to Fort George in St John’s, over 10kms away. 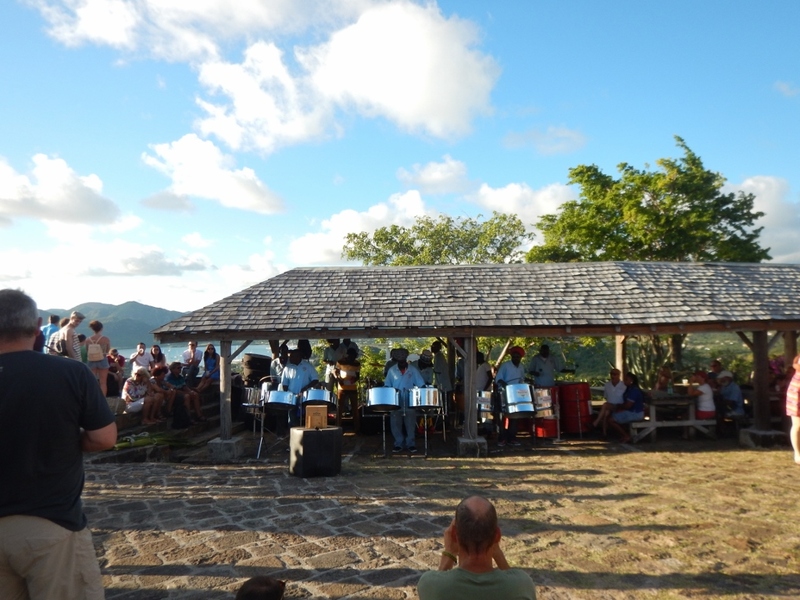 Sunday is party night at Shirley Heights with bands playing, bbqs cooking and drinks flowing, so we joined hundreds of cruise ship participants and danced the night away! We even sang and danced to Men At Work’s “A Land Downunder”! 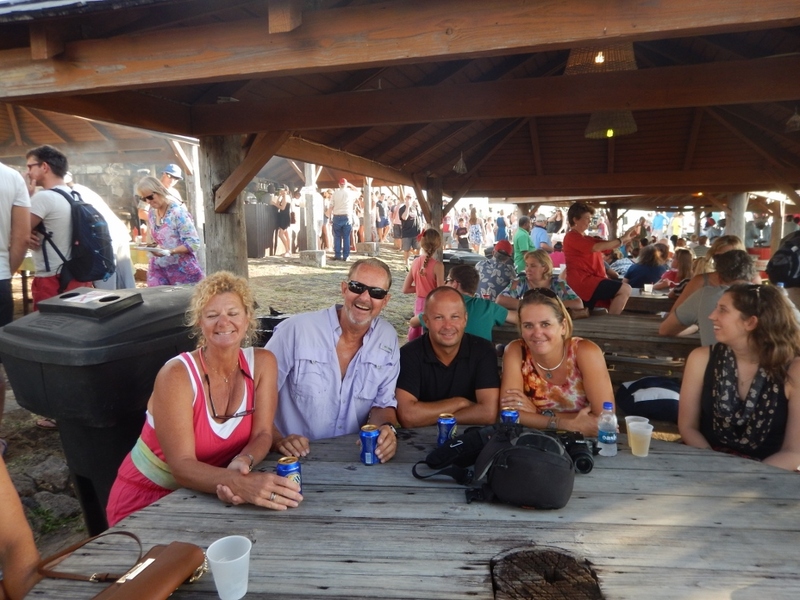 L-R: Jo & Gregg from Serenade, Guillaume & Gwen from Slow Waltz amongst hundreds of cruise ship tourists. The 1st of two bands for the night, a tin-pan band. 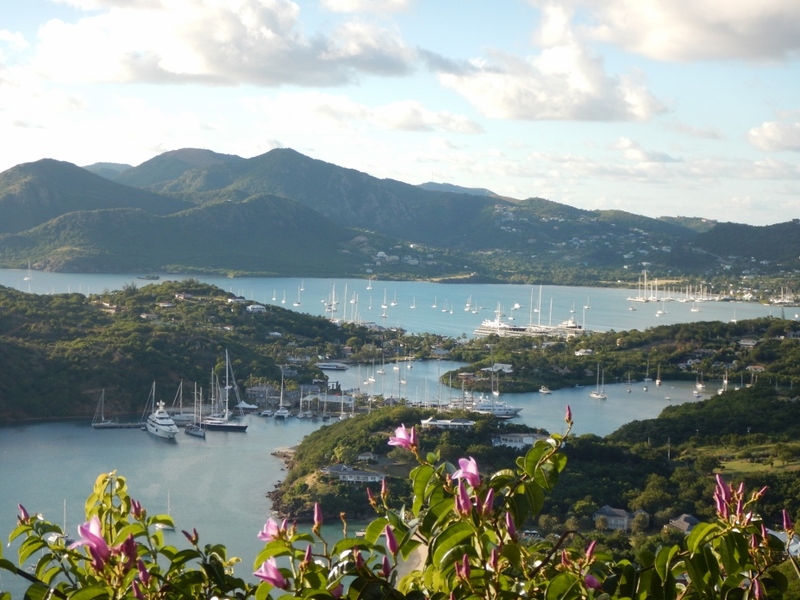 Like many Caribbean islands, Antigua, since first discovered in 1492 by Christopher Columbus, has been colonised by the Spanish, French, Dutch and most recently, the English. The end of WWII marked the beginning of the road to independence, with independence finally gained in 1981. The English Harbour Dockyard, more commonly known as Nelson’s Dockyard, is a major Caribbean yachting centre. It has been restored to house businesses, restaurants and hotels and is a hive of activity. 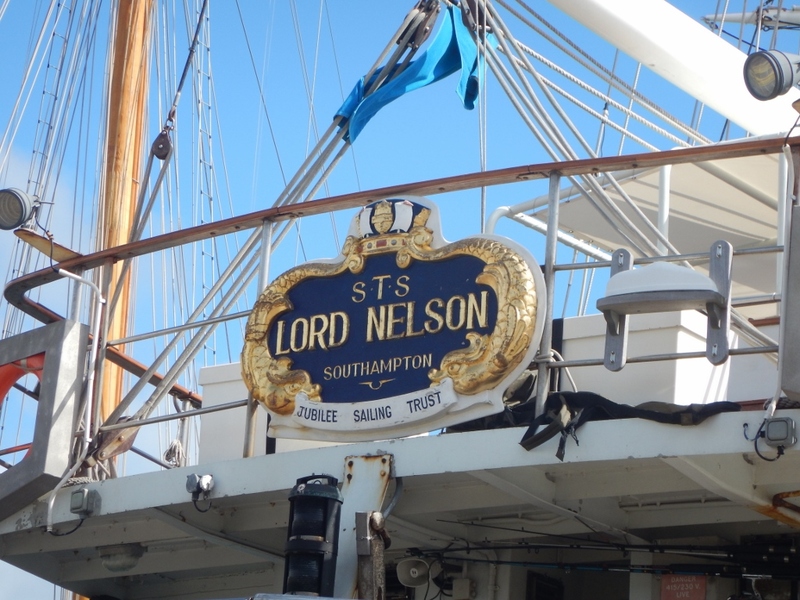 The Lord Nelson sailing vessel, pictured below, was purpose-built to enable able-bodied and physically disabled people to sail together. The Engineers’ Offices now used as a modern hotel. The next day our good friends, Dalynn & Glenn from s/v Amoray, arrived in port and we went hiking with them and their guests, Reed and Cathy. 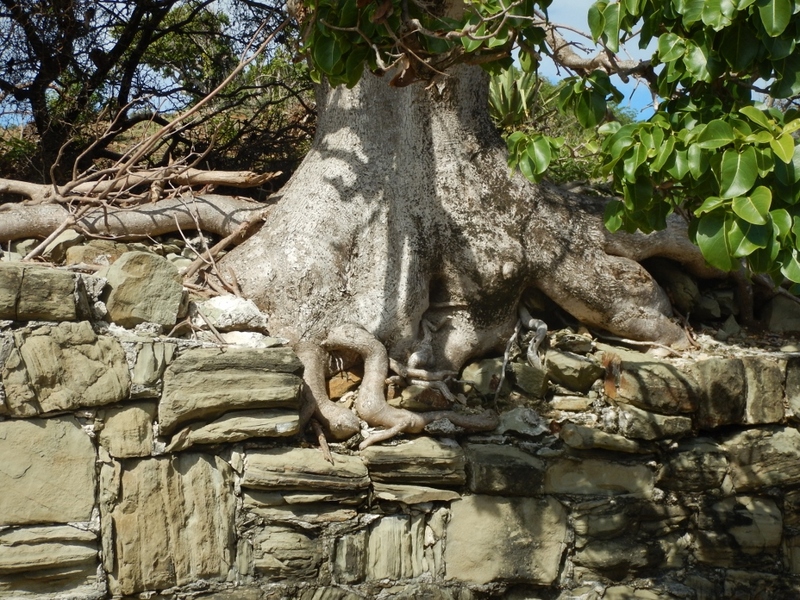 It was a beautiful hike from Falmouth to English Harbour and ended at Fort Berkeley near Nelson’s Dockyard. 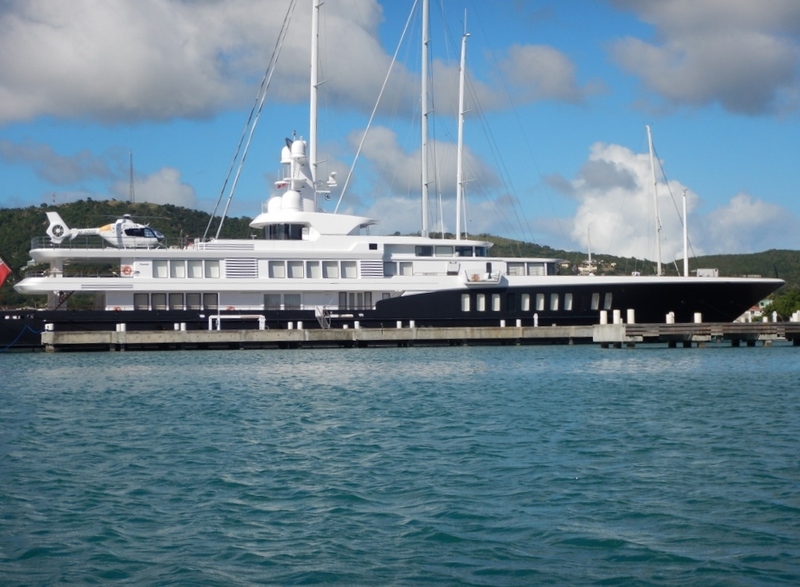 I had to include one photo of the many super yachts here in Antigua. Air is 81m long, 11m wide, has 21 crew and, of course, comes with her own personal helicopter. She’s currently available for charter at 750,000 Euros/week, that’s approximately $1,089,900AU PER WEEK! If you’d like to check out more before booking her, click here. Super yacht, Air, with personal chopper. We ended the year on a high, with friends. We started the night on s/v Nightwatch, courtesy of Mary and Ralph, and then moved to Kool Kat to watch the fireworks from our trampoline. Kool Kat’s dance floor got a good workout and the singing was heard across the anchorage right into the wee hours of the morning! It was a great night and we shared it with Serenade (Jo and Gregg), Nahanni River (Wendy and Doug), Amoray (Dalynn and Glen), Nightwatch (Mary and Ralph) and Slow Waltz (Gwen and Guillaume)! Happy New Year to you all and we hope your 2015 is full of happiness and joy! Sue & Mal. 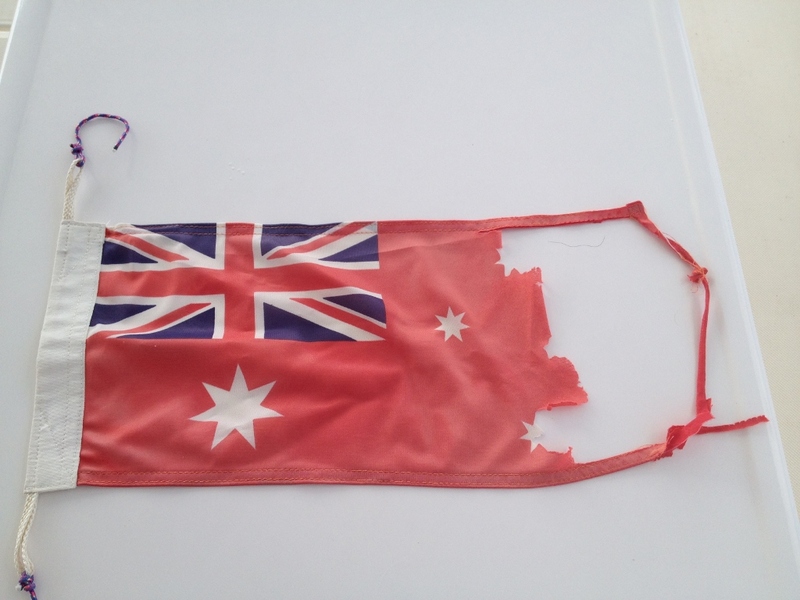 We are asked that question often and our answer is: it’s the Australian Red Ensign. Then people say, but the Aussie flag is blue, why fly a red one? Traditionally the blue flag is used on land and the red one at sea. In reality, we can fly either the blue or the red but, because we are at sea, we choose to fly the flag associated with maritime activity. Then people say, oh, we thought you were British. We can see their confusion and, to be honest, there are alot more Brits over here than Aussies. The very next question seems to be about the New Zealand flag. What is the difference between the Australian and the NZ flags? As I couldn’t remember, and they almost look the same when fluttering behind a boat, I did some research and found the following. 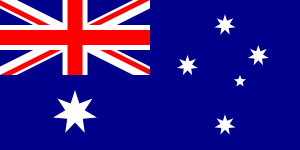 The Aussie flag, both Red and Blue Ensigns, have the Union Jack, the Commonwealth Star and five stars representing the Southern Cross. 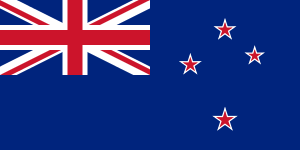 The New Zealand flag also has the Union Jack but with four stars, each with a red interior, representing the Southern Cross. Interestingly, the New Zealanders may change their flag soon as there has been ongoing debate since 1973 resulting in a promised referendum by the current government. Will it be the very recognisable Silver Fern? 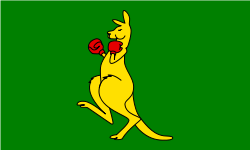 If they get to use the Silver Fern as their national flag, perhaps we could use our Boxing Kangaroo? 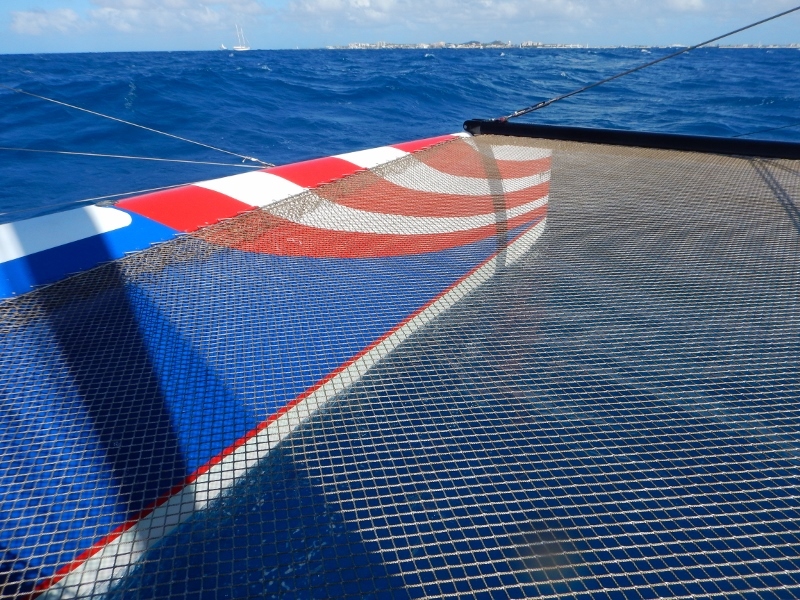 Since we commenced sailing in the Caribbean, we have become more and more interested in flags and, both of us being quite competitive, now regard identification of the flag as a sport. By far, the easiest to recognise are the USA, Canada and France. 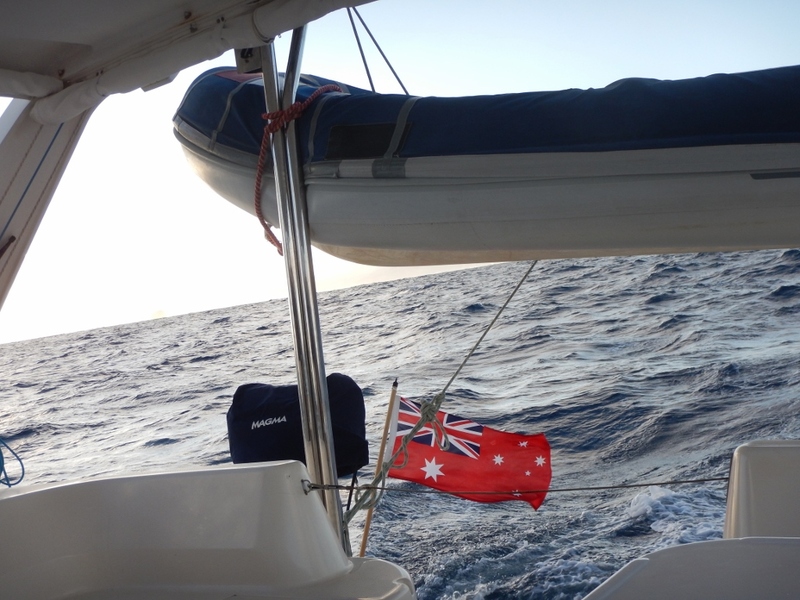 When sailing, in addition to flying the flag of the vessel’s home port, it is customary to fly the flag of the country you are visiting, known as a courtesy flag. At the moment we are in Antigua and it is a beautiful one. Many Caribbean countries have modern designs due to their more recent independence which makes them very interesting. According to Wikipedia, the rising sun on the flag of Antigua symbolises the dawning of a new era. The colours have different meanings, the black is for the African ancestry of the people, the blue for hope, the red for energy or dynamism of the people. The successive colouring of yellow, blue, and white (from the sun down) also stands for the sun, sea, and sand. Upon arrival for the first time in a country and before visiting customs and immigration, it is required that your vessel flies a Quarantine flag. This is yellow, known as a Q flag, and indicates you haven’t yet cleared in. On occasions, if we are sailing from one country and by-passing another, we may pull into a bay to spend the night and fly the Q flag. We can’t go ashore under these circumstances. The next morning we sail away and continue our journey. We did this recently when we pulled into St Lucia for the night, after having left St Vincent and the Grenadines and on our way to Martinique. A sad state of affairs! Our brand new flag! Gorgeous, isn’t she? Anne very kindly gave us an Australian Aboriginal flag but before flying it we want to check if there are any regulations we need to follow. Hopefully it will be fluttering on Kool Kat soon. 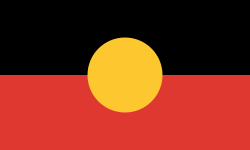 The flag designer, aboriginal artist Harold Thomas, stated black represents the Aboriginal people of Australia, red represents the red earth, the red ochre and a spiritual relation to the land, and yellow represents the sun, the giver of life and protector. 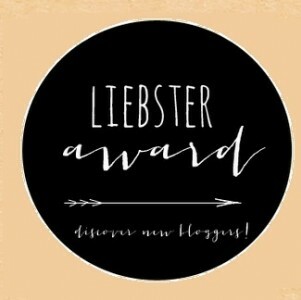 Enter your email address to follow our blog and receive notifications of new posts direct to your inbox. Great to have you on board! We are a couple of Aussies who, after living on a Cat in the Caribbean for three years, have just bought a MoHo and plan to investigate some of our own country.